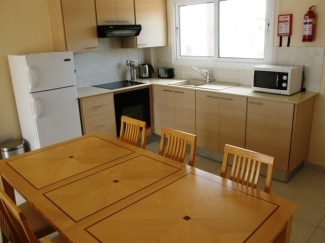 This Apartment in Paralimni is in a medium size complex consisting of 41 apartments. Built over 3 separate blocks and sharing a communal swimming pool with an in built jet pool, the project is complete with a covered parking area. 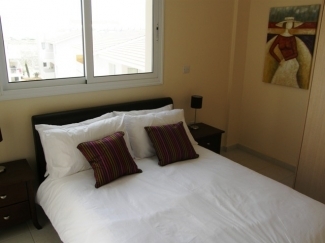 This beautiful modern 1st floor air conditioned property comprises of 2 bedrooms (both having fitted wardrobes). 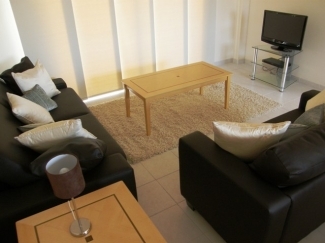 The apartment is beautifully furnished having a very bright and spacious open plan lounge/diner/kitchen. The lounge is very comfortable with a sofa (sleeping an extra 2 guests), TV, satellite and DVD player. Patio doors lead out to the terrace where you can sit and enjoy dinner and a glass of wine. Located on the fringe of the town of Paralimni in an elevated location the complex offers views of the azure-blue Mediterranean Sea. Sandy beaches are a short five minutes drive away offering water sports and many other activities and the trendy tourist resort of Protaras is just 10 minutes away. All necessary facilities and amenities can be found in the nearby of Paralimni, with shops, banks, supermarkets, bus routes and restaurants. These apartments are ideal for permanent living, long-term or short-term let.